Charley King, of Bluebell Events, asked Los Angeles event photographers Embrace Life Photography to photograph her gorgeous table and tent display at the Luxe Linen launch party at Vibiana in DTLA. The glam table setting of gold trimmed white china and gold tableware is set on gold brocade linen. Goblets of various colors and styles add to the beauty of the table setting. Fuschia garden roses and sprigs of greenery create a napkin ring around champagne and cream napkins. 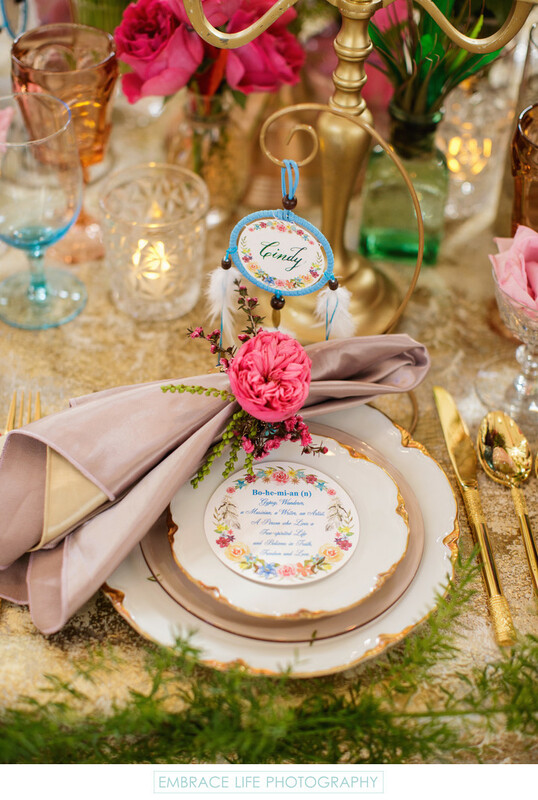 Colorful place cards dangle creatively from gold curved stands. Location: 214 South Main St, Los Angeles, CA 90012.